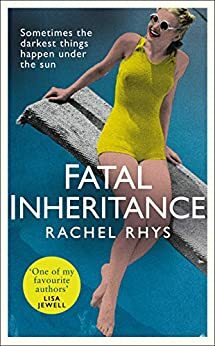 I’m delighted to be kicking off the blog tour for Fatal Inheritance by Rachel Rhys. Her last novel, A Dangerous Crossing, was one of my top reads last year and this book will be joining it this year. I didn’t even bother to find out what it was about, I just knew I loved A Dangerous Crossing so jumped at the chance to read it. With that glorious cover – who could resist? So it was an unexpected pleasure to discover it is set largely in France – where I was on holiday reading it. And it was just the perfect book to read in the hot sunshine. Eve is married to the rather dry and stuffy Clifford when she receives news of a completely unexpected inheritance from someone she doesn’t know. She has no idea of any connection between herself and Guy, who died very suddenly so didn’t meet her to be able to explain. Chapters from his point of view interspersed with the main narrative give tantalising hints of what’s behind the mysterious bequest. She has to go to the south of France to meet his family and find out more about the bequest. There she discovers a whole new way of life, a glamorous life she had never dreamed of, but it seems that her life could be endangered by this bequest. Her mundane married life in England pales in comparison to the glitz and glamour of the Riviera, mixing with authors, artists, film stars and millionaires. It’s a million miles from her previous experience so no wonder Eve is dazzled and entranced. Fatal Inheritance is wonderfully atmospheric and rich in detail. It brings to life the decadence of post-war Riviera life in a very visual way. I could see this making a wonderful film or tv series. It certainly had the feeling of a Golden Age mystery, as is rightly mentioned on the back of the book. It felt to me like an Agatha Christie style novel: classy and elegant. And quite the enthralling thriller it is too, with so much mystery and so many people with unexpected secrets being uncovered. I was completely captivated by Rachel Rhys’ writing. Fatal Inheritance is a stunning, evocative read and I highly recommend you add it to your summer reading lists. RACHEL RHYS is the pen-name of a much-loved psychological suspense author. Fatal Inheritance is her second novel under this name. Her debut Dangerous Crossing a Richard and Judy bookclub pick, was published around the world. Rachel Rhys lives in North London with her family. You’re welcome, it is such a fabulous read! This sounds fun- thanks for sharing!